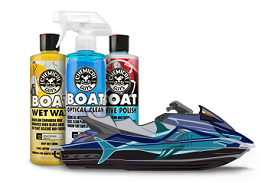 The Chemical Guys JetSeal Paint Protection Sealant And 5050 Paste Wax Ultimate Shine & Protection Kit is the one-two punch for protecting and shining any vehicle. 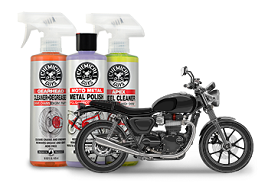 The kit includes everything you need to protect, shine, and enhance any color paintwork for a show-winning shine. The secret to a long-lasting shine is protecting the paintwork. JetSeal is a durable synthetic wax that lasts for up to a full year with just one application. Spread JetSeal over paint, glass, clear optical plastics, polished metals, and any other exterior car part that is shiny or clear. 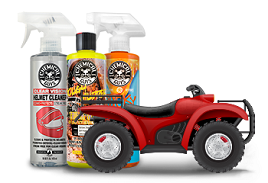 The full-synthetic formula bonds directly into the pores of the paint, creating a slippery shield that water, dirt, bugs, birds, and other filth and garbage just slide off. JetSeal is formulated using innovative UV protection technology that protects your paintwork against fading and discoloration. Chemical Guys blended natural carnauba wax with essential oils and fruit extracts to make 5050 Concours more spreadable, more shiny, and easier to work with than traditional carnauba paste waxes. 5050 Concours is the fan-favorite car wax guaranteed the best paste wax at any price by Luxury & Exotics Magazine. The most captivating characteristic of 5050 Limited Series Concours Paste Wax its ability to color the reflections of the world. Sometimes being a two-face is not a bad thing. The Fluffer is a super soft 2-Sided Microfiber Towel with a Medium-Nap on one side and a Heavy-Nap on the other side. Now one towel can safely remove light dust and airborne contamination with the heavy nap while the medium nap side polishes surfaces to a show perfect shine. The ultra-soft silk lining around the edge reduces the chances of scratching with 100% of the towel’s surface.